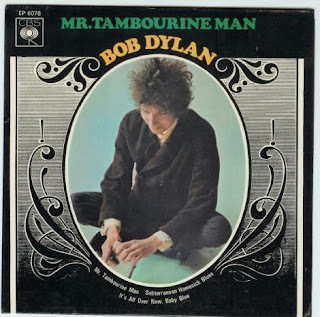 Attempts to analyze "Mr. Tambourine Man" are grating exercises in making something beautiful and light into something ponderous and heavy. The song was released in 1965 as the first track on side 2 of the album "Bringing It All Back Home." It is a crystal, the brightest star in the sky; it sparkles from every angle. I think it's perfect. I don't listen to it all the time because it's one of those songs that you hear once and it's committed to memory. I didn't enjoy writing the haiku because I thought that there was nothing I could say. Since that wasn't an option for a haiku project about Dylan, I took the straight course. "The time seems to be early morning following a night when the narrator has not slept. Still unable to sleep, though amazed by his weariness, he is available and open to Mr. Tambourine Man's song, and says he will follow him. In the course of four verses studded with internal rhymes, he expounds on this situation, his meaning often heavily embroidered with imagery, though the desire to be freed by the tambourine man's song remains clear." Other say it's about drugs. OK, sure. As you wish. Here's the oddly smug-sounding vocals of the Byrds as they perform it on TV. Check out the byrd houses. Hello Robert, yes the classic Bob Dylan song. 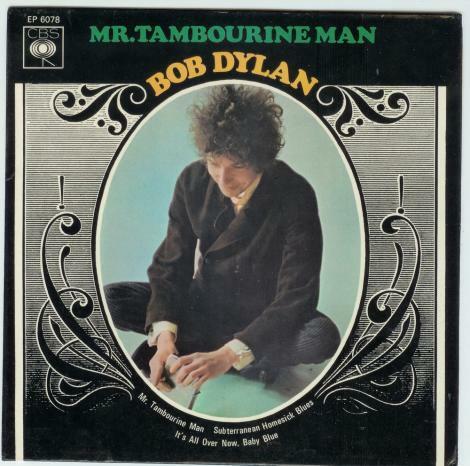 Come and join us inside his Music Box http://thebobdylanproject.com/Song/id/428/Mr-Tambourine-Man and listen to every version of every song composed, recorded or performed by Bob Dylan.